The Discovery astronauts and their space station counterparts continued unloading a newly attached storage module and successfully performed electronic surgery to bypass a short circuit in a U.S. carbon dioxide removal system. 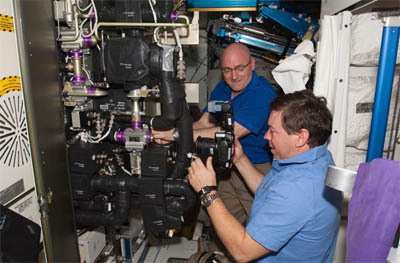 Station commander Scott Kelly also installed a filter in an oxygen generator and helped flight controllers test the refurbished system. Flight Director Royce Renfrew, who oversaw the bulk of he actual repair work, said the electrical operation went smoothly. "It was somewhat humorous to watch medical doctor Barratt with a pair of forceps in his hand reach in and get those small wires out and clip them," he said. "We put all that back together, Mike did another great job on that. ... (We) spun that up and I actually got a text message from the engineering folks that said that CDRA is now back up and running." While that work is going on, Kelly worked to install test gear and a filter in the U.S. oxygen generation assembly to restore that device to normal operation. Flight controllers ran into several snags powering up the OGA but Renfrew said by the end of the day, the device appeared to be in good shape. "We wanted to put some chemicals into the OGA and put a little screen in there to filter out some particulates," he said. "Commander Kelly did that work this morning and then we spent some time commanding it from the ground. We got a little bit behind the timeline there because we had to tweak a few of the parameters for a couple of hours to get it behaving exactly like we wanted it to. "We eventually got that going a little bit late in the timeline. ... We still have about an hour's worth of ops on the ISS commander's activities tomorrow to go back in and strip out all that temporary (equipment) we installed today." Water samples collected from the OGA will be shipped back to Earth aboard Discovery for detailed testing to make sure the water is particulate free. If so, the OGA will be activated for normal use aboard the space station. Discovery's mission was extended two days to give the combined crews more time to unload the Permanent Multipurpose Module that was attached to the station Tuesday. If all goes well, the transfer work will be completed Sunday, hatches will be closed Sunday afternoon and Discovery will undock Monday morning around 7 a.m. Landing back at the Kennedy Space Center is targeted for 11:58 a.m. Wednesday.